Doctors are masters of delayed gratification. While all our high school buddies were hooking up with the cheerleaders, we were busy cramming for our SAT's to get into a good university. Then while our college buddies were hooking up with sorority girls, we were spending nights and weekends taking Kaplan courses to ace the MCAT's. As we challenged our brains in medical school to see how much knowledge one can possibly squeeze into a three pound mass of neural tissue, we kept having to make excuses to miss our friends' engagement parties and weddings. After that we could only gaze enviously at their new babies while we were too exhausted in residency to contemplate even making any. But eventually it is our turn to enjoy life and all its blessings. I can't believe it's been over two years since I wrote about my desire to acquire a 3D TV after we bought our house. We remodeled the family room to specifically fit a large flat screen television. I never could find a model that I liked though. They were either too expensive, or had poor picture quality, or poor 3D rendering. Even when our old LCD TV broke, I didn't go out right away to replace it with an awesome new one. Remember, I'm an expert at delayed gratification. I could wait. Now at last, I found the TV that fulfills my every desire. The price is right. The size is good. The reviews are excellent. I took a deep breath and clicked "purchase" on Amazon. I'm now the owner of a brand new Samsung 65" 3D TV. After all the years of waiting, the feeling was rather cathartic. I no longer felt that sense of emptiness and longing I had every time I surfed the electronics pages or walked through Best Buy. The months and years of anticipation will be fulfilled with a knock on my front door in one week. On the day of the delivery I took time off from work to welcome my new TV. The courier company gave me a delivery window that was smack in the middle of my work day so I had to take a whole day off. My wife was aghast. "How much money is this TV really going to cost us?" she asked irritably. But I didn't care. Years of waiting are now about to be sated and no amount of money will keep me from enjoying the fruits of my hard labor. I could hardly sleep the night before the delivery. I set my alarm clock early so I wouldn't oversleep the expected delivery time. After a fitful night, I got up early before the alarm and waited anxiously for the rumble of a large truck to stop in front of my house. Eventually I heard it. I quickly swung open the front door before they even had a chance to ring the doorbell. And there it was, an enormous flat box with my new love being carried inside by two burly guys. They brought it into the house and even set it up on its designated spot. I signed the paperwork and shook their hands as they left, leaving behind a grown man with his (expensive) new toy. My hands were shaking as they sought to plug in the power cord and the HDMI. Now to turn on the electronic love of my life. Shoot, these new TV's don't even have a power button. I have to use the remote control to even get this thing to come on. This I do. With the sense of wonder that Luke Skywalker must have felt when he first fired up his light saber, I pushed the big red button on the remote and watched my TV come to life. Except something is wrong. There are these funny black streaks across the top of the picture. 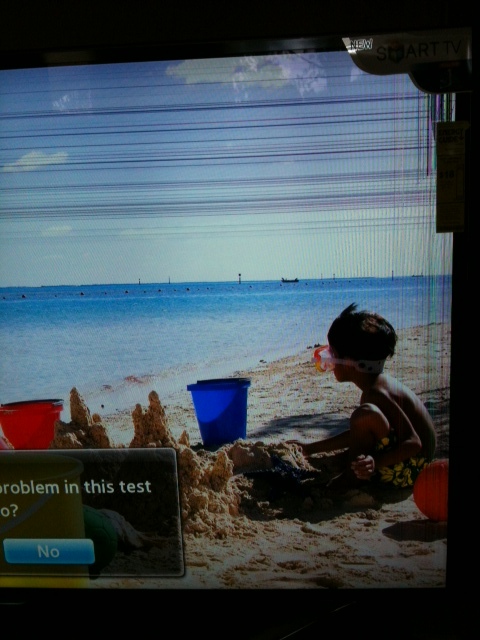 The right side of the screen is festooned with lines in rainbow shades. I've never seen any TV screen like this before. Maybe it just needs to warm up and they will go away. I start the initiation process of owning my brand new TV. Televisions are no longer as simple as plugging it into an outlet and attaching a cable line. Now when you turn on a TV you have to enter the date, time, language, and in this TV, the log in information for the built in wifi. Do you see any problems with this TV? It took about fifteen minutes to input all the data the TV asked for. After that, the lines were still there. If they're supposed to go away, it should have done so by now. Crestfallen, I desperately searched through the user manual for an explanation and hopefully a solution. Okay, here's something. 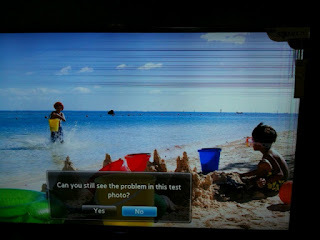 In the "Menu" option there is a selection for picture diagnosis. This will tell me what to do. Using the remote, I went to "Menu" and found the picture diagnosis. I clicked on it and a bright picture of a beach scene popped up on screen. On the bottom were two choices: is the problem still there, yes or no. Yep it's still there. Black streaks across the top and rainbowed streaks down the right side. I clicked "yes". Instead of giving me a solution, it directed me to call Customer Service. Damn. Even though the TV packaging didn't have a blemish on it, seems like perhaps my TV at one point may have gotten dropped or the panel warped during transportation from Korea or wherever it was assembled. This is not going to go away by itself. Instead of calling Samsung Customer Service as directed, I called Amazon. That's the great thing about Amazon. They have the best returns and customer service in the world. I quickly explained my problem. The agent didn't even ask for any picture confirmation. He just gave me instructions on how to return the TV. No hassles. No delays. Unfortunately they're sold out of this particular model. It will take a couple of weeks before they get a new shipment. Sigh. Now I'm sitting at home with my brand new broken TV, awaiting the couriers to come back to pick it up and return it to Amazon. This is a tough lesson that I should have remembered from Christmas mornings of childhood--the anticipation is always better than the receiving. This delayed gratification is going to be drawn out a few weeks longer. It had been a long, very long, day. The abdominal operation started before most people had even gotten up to brush their teeth. Around the time many will be hitting the bars for happy hour, we are finally starting to close the belly. The attending surgeon and chief resident begin closing up the abdominal fascia. I am anticipating a quick closure so I start lightening up the anesthetic. Thank God. The only thing I've had to eat all day was an energy bar that I snuck in under my mask hours ago. I haven't even had anything to drink during the entirety of the procedure. It's just as well since nobody bothered to give me a bathroom break. When they finish, the attending congratulates the chief for a case well done. They shake hands across the table, hand the skin suture to the intern, and leave the room. I look at the operating site. The incision is about ten inches long. How much time could this possibly take? The intern grabs the needle holder and starts to make that tricky first stitch in the corner of the wound. Trying to get the suture to go right at the apex of the incision while hitting the layer of dermis, the intern makes several passes through the skin while being guided by the junior resident. After a few fumbles and do overs because of an air knot, he is finally able to proceed with closing the skin. With the medical student following his suture, the intern progresses at an agonizing pace. Each stitch is performed with great deliberation, taking exponentially longer to make than an experienced surgeon. All the while the junior resident is guiding the intern, pointing to the exact location where the next stitch has to be placed. The student tries to follow as best as she could but a couple of times she still manages to cause the intern to loop his suture, almost forming a knot. I test my train of fours. Yup, four out of four. This patient is going to wake up any second. The minutes tick by. Struggling inch by inch, the intern eventually makes it to the trickiest part of the skin, the umbilicus. This is the area that baffles most new surgeons since the wound is semicircular instead of linear. The pace of the closing slows down even more as the young surgeon tries to align the round skin wound a millimeter at a time. Then it happens. The patient starts taking spontaneous breaths and fights the ventilator. "Anesthesia, the patient is bucking!" yells the junior resident. I look over the drapes. They have less than four inches of skin to close so I better not give any more muscle relaxants lest I can't wake up the patient at the end of the case. I quickly draw up a syringe of propofol and bolus the patient to stop his movements. The patient calms down and they continue with the case. The intern eventually makes it around the navel. Now it's a straight line down to the end of the incision. Then suddenly they stop. The intern says he has to switch sides with the medical student since now he has to suture going in the opposite direction. The student obediently switches sides and the intern asks for another skin suture. He again takes his time securing that crucial first knot deep in the corner of the skin. I can see the patient is trying to breathe on his own again so I give another bolus of propofol. If I give too much propofol here at the end I won't be able to wake up the patient either so I have to be careful. At last, he makes his way up the abdomen so that now the two sutures are side by side on the skin. The medical student snips off the two needles and the intern starts to tie the ends together. Then...SNAP. He pulls on one end too hard and breaks the suture, leaving it too short to tie the knot that will close the skin. I think my bladder ruptured right then and there. Now the junior resident steps in. He grabs a third stitch and continues the procedure by tying the new suture to the shortened suture. He then finishes up the closure until once again two ends are facing each other, waiting to be tied. I am so relieved until he hands the the loose ends to the intern for the last knot. I groan under my mask. Keeping my fingers crossed, I watch as he tentatively makes that essential tie. Too loose and the air knot will allow the skin to gap open. Too tight and he could break the stitch, making us start all over again. 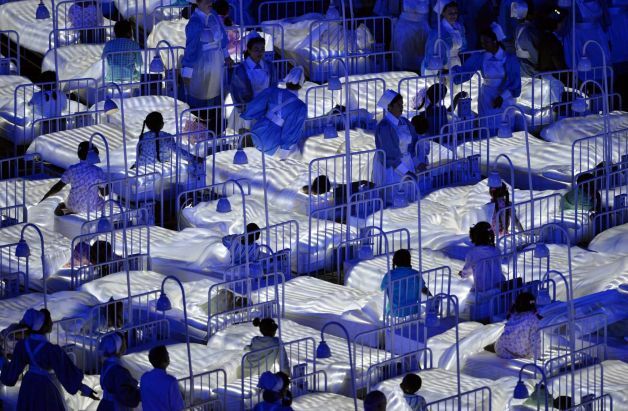 The nurses have already finished counting their instruments three times. They're holding wet laps in anticipation of cleaning up the patient. The cleaning crew keeps peeking into the room to see when they can finally come in. All eyes are on the intern and the two delicate 4-0 vinyl sutures he is holding in his hands. He ties the sutures and meticulously cinches the knot down onto the skin. No air knot. No snap. Triumphantly, he finishes making a line of knots. One, two, three, four knots he makes in quick succession. He cuts off the ends and tucks the knot under the skin. It's finished. The nurses quickly wash the patient and puts dressing over the fresh wound. The patient opens his eyes as soon as I turn off the gas. I hardly even have to give any reversal agents to counteract the muscle relaxants. We get the patient off the operating table in record time and head to the recovery room. My lips are parched, my stomach is rumbling, and my bladder feels like it's about to go supernova. Thank goodness July only comes around once a year. I'm sure many of you read the recent New York Times article about Rory Staunton, the twelve year old boy who died from bacterial sepsis despite being taken to the hospital emergency room multiple times. According to the story, numerous mistakes were made by the physicians and the hospital taking care of him. This has brought torrents of indignant comments and sympathetic editorials. Of the over 1600 comments at the end of the article, many were written by people who shared their own tales of emergency room horrors and clueless doctors. After reading the lengthy piece, my first reaction was, it must be nice to have a New York Times journalist as a family friend. The reporter is a friend of the boy's uncle. So right away you know this was not going to be an impartial airing of facts. The hospital and its staff are also hamstrung in their abilities to defend themselves. With all the bad publicity and potential lawsuit hanging over their heads, I'm sure they've been advised by their lawyers or insurance companies to just keep their mouths shut for now. As the old saying goes, there's two sides to every story and this story has only presented one side. Now White Coat's Call Room has written his own lengthy and excellent rebuttal to the article. He goes through it and point by point explains why the case is not as simple and obvious as Mr. Dwyer would have his readers believe. Even if you're not an ER doc or a pediatrician, you should read it for its illumination of yellow journalism in the NY Times. Nice job White Coat. Somebody's got to stick up for our fellow docs when they can't defend themselves because of legal precautions. I Got Free Money From The Affordable Care Act! Thank You President Obama. 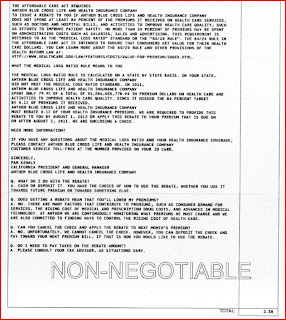 You know the junk mail you often receive in your mailbox that looks like a check but in fact are letters of solicitation used to make you open the envelope to see who mailed free money to you? You soon realize this is not real money and drop the whole thing down the circular file. Well imagine my surprise when I got an official looking envelope from my Blue Cross insurance that had what looked like a check in the little window on the envelope. Why would the insurance company be mailing me money without me begging, cajoling, or pleading for it? I eagerly ripped open the envelope. Sure enough, it was a check, along with a long explanatory letter. According to Blue Cross, I am getting a refund on my insurance premiums thanks to the constitutional passage of the Affordable Care Act aka Obamacare. Obamacare stipulates that at least 80% of an insurer's premiums must go towards "activities to improve health care quality." How much did Blue Cross shortchange state residents on improving healthcare in California? According to their auditors, they only paid 79.9% of the premiums collected on medical care. Thus because of the ACA, the company has to refund me my portion of the $1,286,555,778.00 in insurance premiums they received in California last year. So what is my share of the $1,286,555.78 the company is refunding to Californians? If you look way down at the bottom of the letter, you'll see that I got a check with the princely sum of $2.58. 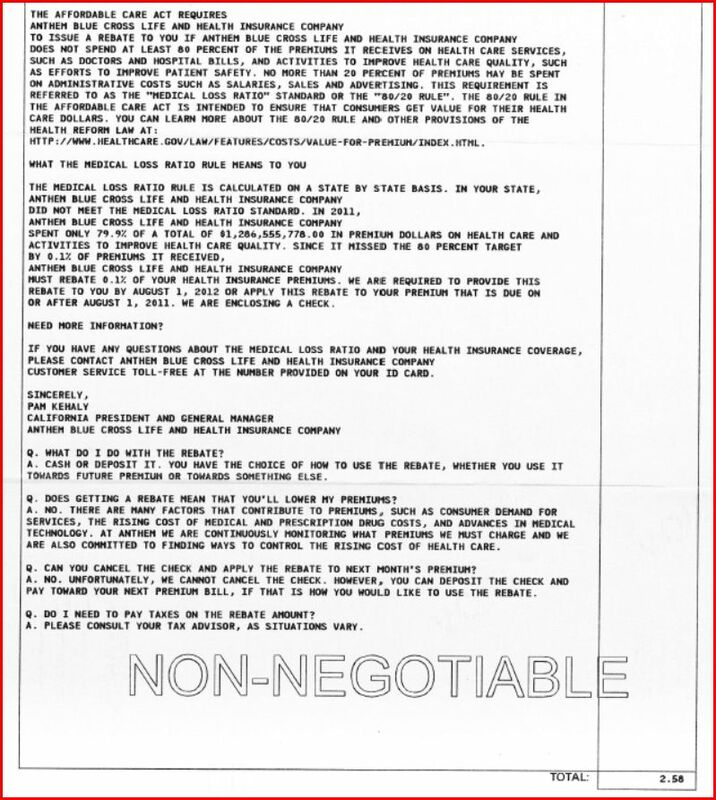 According to the letter, even this miniscule amount may be taxable income, "Please consult your tax advisor, as situations vary." Thank you President Obama. I knew you were looking out for the little guy. Six figure school debt! Skyrocketing malpractice insurance premiums! Onerous government regulations! We physicians frequently and loudly complain about the financial burdens we suffer to do our jobs. We bemoan declining reimbursements for services rendered and increasing costs of staying in business. But is the message being heard? If you're a member of the lay public you probably haven't paid much attention to the plight of doctors. Instead you're more likely to form your impression of doctors based on pop culture entertainment. Take for instance the TV show "House Hunters". It's a program that follows individuals as they search for their perfect house. For years it's been one of my favorite guilty pleasures. Recently they aired a couple of episodes that brought into sharp focus how a program like this can influence people's ideas about physicians' wealth. One night, the show's subject was Joey, an anesthesiologist who moved with his wife to Wilmington, NC. The camera showed how hard Joey works when they see him waking up at 4:00 AM to get ready to go to the hospital. For their "forever home" the family has a budget of $800,000 to $1 million. However Joey says he'll even go up to $1.25 million if the house was perfect, though his wife quickly nixed that idea. Nevertheless they did briefly consider a house the realtor showed them that listed for $1.35 million. Now remember that the median home price in Wilmington is a little over $140,000. Though the couple looks like they are only in their thirties, Joey and his family don't seem to have any worries about student loan debt or anxiety about malpractice insurance. Do you think viewers of the show are concerned for this family's finances? Of course not. They only see a rich doctor who can buy a house that costs six times more than a house that regular people can afford. Another episode of "House Hunters" trailed an emergency physician from Ohio as they shopped for a vacation home in the U.S. Virgin Islands. Again it's a young family with two children in tow. They show off their custom built McMansion in Ohio with its twenty foot ceilings, granite countertops, and stainless steel appliances. The family certainly don't look like people who are deep in debt. Then they show the clan traipsing through the white powdery sands of St. Croix. They finally settle on a dream vacation home that most people would never have the opportunity to rent much less own. Is this depiction of physicians representative and accurate? No, it's TV. There are plenty of doctors who are in greater financial straits than these families. But until doctors can project a more persuasive image of their plight than what's shown on basic cable, we are going to be shouting into the void. Most people couldn't give a darn if Obamacare cuts physicians' incomes. It will still be far higher than the average income in the U.S. as the luxury homes of doctors shown on TV will attest. We are currently tantalizingly close to achieving perfect anesthesia. What is a perfect anesthetic? In my opinion, it should be a substance that has a rapid onset, zero to minimal side effects, and fast elimination. Several substances that are in the experimental stages are leading us toward this holy grail. I recently mentioned the finding that methylphenidate, or Ritalin, has been discovered to quickly reverse the effects of propofol. The problem with giving propofol was that a patient's ability to regain consciousness depended on how quickly the drug is eliminated from the blood. Ritalin appears to stimulate the upper neural pathways that leads to more rapid emergence. Now with a combination of propofol and methylphenidate, a patient can be awakened at will without the anesthesiologist guessing how long the elimination time is for a particular person. The next drug that will lead to the perfect anesthesia is Sugammadex. Even though Sugammadex has not been approved by the FDA for use in the United States, it has already been used in Europe for years. The drug rapidly reverses the paralyzing effects of rocuronium by wrapping itself around the rocuronium molecule, quickly making it unavailable to cause paralysis. Its effect works faster than even succinylcholine elimination, the current gold standard. The FDA denied Sugammadex approval because of some reported allergic reactions, which have been found to be minimal in medical studies. By contrast, succinylcholine is known to cause profound and feared complications, including hyperkalemia, muscle rigidity, cardiac arrhythmias, allergic reactions, and even death. Sux is one of those drugs that, if it had not been grandfathered in by the FDA decades ago, would never be approved today. But it is the only muscle relaxant that can achieve such rapid onset of paralysis required for emergency endotracheal intubation. Rocuronium can achieve similar onset of paralysis with none of the side effects of succinycholine. But its drawback has always been its prolonged effects. Now with Sugammadex, that will no longer be an issue and another dangerous drug can be taken out of the anesthesia cart and put into the museum of outdated drugs like ether and methoxyflurane. With a combination of these two pairs of drugs, we can finally eliminate the expensive anesthesia machines and its complicated vaporizer system. Total IV anesthesia will be the way to go. Volatile agents such as sevoflurane and desflurane require vaporizers that are expensive to maintain. Refilling them can contaminate the air in the operating room. And they can fail leading to overdosage to the patient. Inhalational agents also cause malignant hyperthermia, the much dreaded nightmare of every anesthesiologist. Plus, what anesthesiologist hasn't walked into an operating room in the morning and found the the previous night's anesthesiologist forgot to turn off the vaporizer completely, gassing the OR all night? 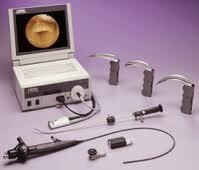 Vaporizers are difficult mechanical devices that can be easily removed and not missed at all with the use of TIVA. What will be left is just a ventilator. By using TIVA, the OR can use the same ventilators as the ICU and eliminate the anesthesia machine. All we need is an Ambu bag to mask the patient then connect him to a regular ventilator with its myriad of vent settings at our disposal. This will save money by getting rid of the anesthesia machine and standardizing ventilators througout the hospital. If we ever get approval for injectable oxygen, conceivably the ventilator could be history too. Yes these are exciting times for anesthesia. Most medical research attempt to show incremental improvements to already proven treatments. But a team out of Boston Children's Hospital is working on a project that I believe will truly revolutionize anesthesia, and medicine in general: injectable oxygen. John Kheir, MD, et al, have been studying ways to bypass the lungs' oxygenation function and give the oxygen directly into the bloodstream ever since he and his colleagues had the misfortune to watch a pediatric patient die from severe respiratory distress and hypoxia in 2006. Attempts at oxygenating blood directly have been tried for a century. Unfortunately the early experiments met with failure when patients developed air embolism instead. Later, machines such as the cardiopulmonary bypass machine and ECMO were invented that simulated lung function outside the body. While the machines are generally successful, they also carry high risk complications. First of all, they are highly invasive, requiring tricky cannulations of central vessels with large tubing. The machines are also bulky, tethering the patient in place with no possibility of mobility. Then there are all the complications associated with these devices. Patients have suffered air embolism, thrombotic embolism, bleeding catastrophes, and strokes when placed on these machines. Dr. Kheir and his team changed the whole concept of oxygenating the blood by not trying to simulate the lungs. They used a machine called a sonicator that emits sound waves to mix together oxygen and lipids. The resultant emulsion carries three to four times the amount of oxygen that is carried by our own red blood cells. The lipid-O2 particles can be safely injected into the bloodstream without causing an embolism. They tested their creation on rabbit models which had their trachea occluded for up to 15 minutes. After injecting the rabbits with the emulsion, the rabbits' hypoxia immediately improved. Dr. Kheir states that currently only small amounts of the emulsion can be given. It cannot be infused over a prolonged period of time as the patient would likely get fluid overloaded receiving that much volume to maintain oxygenation. He envisions keeping small syringes of the emulsion in a crash cart for emergency situations. I say he is being too modest. While the research team claims that the amount of emulsion that needs to be infused is currently too large to support more than a few minutes of oxygenation, I have confidence that they will refine and improve their technique to incorporate larger amounts of oxygen into their system. Once that happens, the product could truly change the practice of anesthesia. Imagine the potential of bypassing the lungs during an operation. Anything involving the use of the cardiopulmonary bypass machine would immediately become obsolete. Performing a double lung transplant would be a snap. Lung resections and pneumonectomies would no longer require the intricate placement of double lumen endotracheal tubes. We won't have to rush patients to the operating room for emergency tracheostomies because of foreign body or tumor occlusions of the airway. ENT can perform their laser surgeries in the oropharynx with little fear of causing an operating room fire because no oxygen will need to be blown into the lungs. Intubated ICU patients will suffer less barotrauma if they can give their lungs a rest for even a few hours a day. The possibilites are truly astounding. The use of this oxygenated lipid reaches beyond the hospital walls. Firefighters would carry oxygenated lipids into a fire instead of pressurized oxygen. They can inject flame victims with the stuff to get them safely out of an inferno. Near drowning victims can be injected with oxygen instead of receiving the less efficient mouth to mouth or bag-mask resuscitation. The list goes on and on. I wish the Boston team the best of luck on improving their wondrous work. American businessman and multimillionaire Christopher Cox suffered a horrendous blow when he was involved in a car accident in his Ferrari 250 GTO the other day. 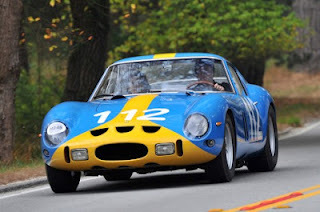 He and his wife were in France taking part in a caravan of Ferraris celebrating the fiftieth anniversary of the GTO when the incident happened. Mr. Cox's car was estimated to be worth over $30 million. Besides the devastating blow to the rolling money on wheels, Mrs. Cox was reported to have suffered a broken leg. I can just imagine what went through Mr. Cox's mind when the accident occurred. What the f***! Somebody just hit my $30 million car! S***! Who are the morons that did this?! Honey, will you stop screaming? The car will be okay. We just need to fly my private mechanic here and spend a few more millions to restore this car again. It's been done before. What do you mean your leg is hurting? Oh. I don't think your leg is supposed to bend like that. God where is my cellphone. I need to call the restoration guys right away. You want me to call the ambulance? My car just suffered millions of dollars in damages and you're worried about your leg? That leg will heal for free with the universal health care they have here in France. I have to spend mucho dinero to get this car fixed up.Stop grabbing me. I need to go out to see how much damage was done. Geez I'm glad I left the mistress back in Monaco. Your leg will be fine. The old sawbones will put a couple of pins in there and you'll be as good as new. Where am I supposed to get pristine body panels for this fifty year old masterpiece? How can I ever show my face again at the Pebble Beach Concours? Everybody will know this car is damaged goods. Alright, alright. I'll call for the ambulance. (Whispering into phone) Siri, locate the closest Ferrari body shop to Saint-Etienne-des-Guirets, France. Make sure they accept American Express Black Card. Next make a call to Hotel Metropole. I'm going to need Bridget for the next few weeks. An article in the Wall Street Journal today details PepsiCo's plans to expand in the second largest consumer market in the world, China. 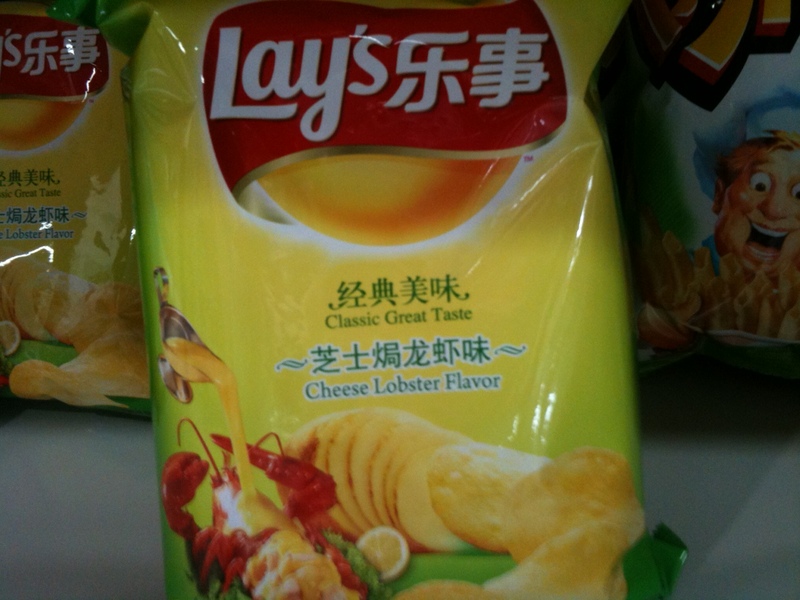 According to the paper, the company will try to increase the Chinese consumption of its snack foods by developing more regional flavors favored by the locals, such as fish soup flavored potato chips and fungus flavored oatmeal. Its commitment to the market is highlighted by its sixth factory being built in that country. How much more money does the company think it can make in China? Here are the startling statistics from the company itself. 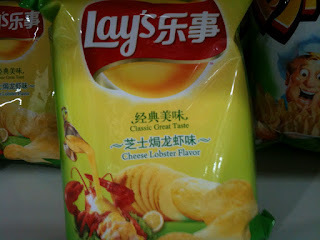 Currently, the Chinese buy only one small bag of potato chips every couple of weeks. By comparison, Americans buy fifteen bags in the same time period. The average Chinese only buys 230 beverages per year. The Americans? How about 1500 drinks per year. Are those numbers correct? One thousand five hundred drinks per year? That's over four drinks per day. I'm going to assume they mean soda drinks, not alcoholic beverages which the company doesn't sell. And I'm sure not all the drinks are diet sodas or bottled water. What about all those chips? We eat about one bag of chips per day? Altogether that's hundreds of extra empty calories that are consumed on a daily basis which have little hope of getting burned off during the course of our sedentary American lifestyle. Do we really want to lead another country down this path of ruin? Do we need an extra one billion obese people on this planet? It's a good thing the Chinese government has trillions of dollars in reserve. They're going to need it to treat all their citizens in the future who come down with the same obesity related diseases as Americans. 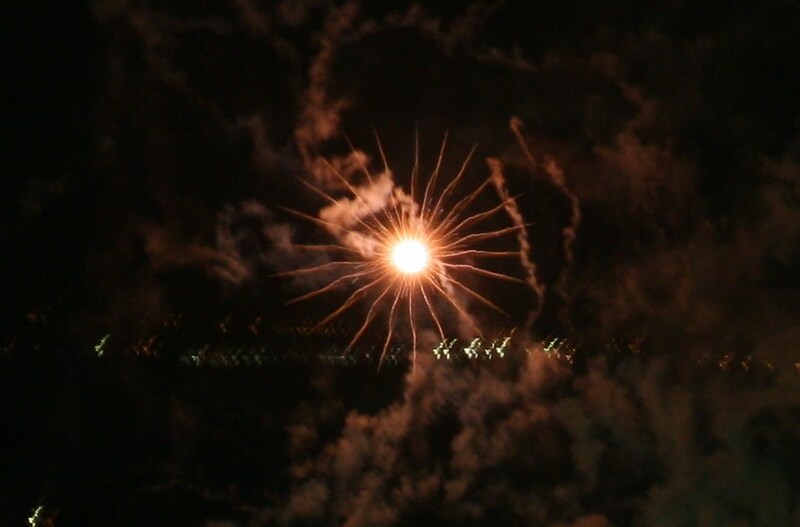 I was reviewing my pictures of fireworks from Fourth of July when I was struck by this one. I must have captured it just as it exploded. Pretty cool. I wonder if that was what the Big Bang looked like twenty billion years ago. Will Ritalin Lead To The Demise Of Anesthesiologists? A recent study in the journal Anesthesiology showed that the common drug Ritalin, or methylphenidate, can quickly reverse the effects of propofol. The research was done by Jessica Chemali B.E. ; Christa Van Dort, Ph.D.; et al. out of the Massachusetts General Hospital. They conducted several studies on the emergence from propofol anesthesia in rats who were given Ritalin. Their first study used rats who were given a propofol IV bolus of 8 mg/kg. That amount, by the way, is pretty large since the usual induction dose for propofol in humans is only 1-2 mg/kg. One set of rats was then given a normal saline bolus while another set was given a bolus of IV Ritalin. The rats given NS redeveloped their righting reflex with a median time of 735 seconds. The rats given Ritalin started righting themselves at a median time of 448 seconds, or almost a 40% improvement in recovery. In a second set of experiments, the rats were given propofol infusions through their tail veins. After achieving a concentration of propofol that kept the rats supine, NS was injected into the rats along with the removal of a stimulatory probe. This produced no changes in their activities. Then IV methylphenidate was given to the rats . All the rats started exhibiting signs of arousal such as kicking or blinking, with complete righting at a median time of 82 seconds. This is very promising research and is good news for anybody who has ever had difficulty arousing a patient after giving propofol anesthesia, ahem Dr. Murray. Once again, because of our profession's single-minded pursuit of patient safety, research may be pointing the way towards even safer anesthesia. But here is where the situation becomes difficult for anesthesiologists. The administration of propofol has been widely cautioned in the past as having no antidote. Therefore we have always recommended that only doctors with years of training in injecting propofol should be giving it to patients either in procedure rooms or the ICU. Now that there may be a reversal agent for the drug, will this give the gastroenterologists, CRNA's, cardiologists, and virtually anybody who wants to sedate a patient an opening to claim more cases from anesthesiologists? Once narcotics and benzodiazepenes could be reversed quickly and safely, they became drugs that could be given by virtually anyone with some sort of medical license. Will Ritalin's ability to rapidly produce emergence from propofol anesthesia lead to a similar calamity for anesthesiologists? Damn you Mass General and your overachieving researchers. In an attempt to extend the patent protection of OxyContin, Purdue Pharma is conducting clinical trials of the narcotic in children ages six to sixteen. The company is doing this because OxyContin currently rakes in $2.8 billion a year. Purdue hopes to prolong its Oxy patent by another six months if the FDA approves its studies. That would work out to $1.4 billion of extra sales. That sounds like an investment any company would make. But is it a wise move for children? 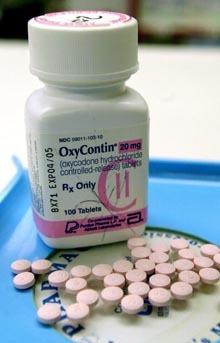 OxyContin is one of the most addictive prescription pain medicines on the market. Its destructive properties have been widely publicized. The drug has been implicated in the addictions or deaths of numerous celebrities, including Rush Limbaugh, Lindsey Lohan, and Heath Ledger. The CDC estimates that one in five high school students have used prescription drugs without a doctor's prescription. How do they get the drugs? Usually from their parents' medicine cabinet or, if they have the money, the local street dealer. I'm not saying that children don't feel pain. They have nerve endings just like everybody else. 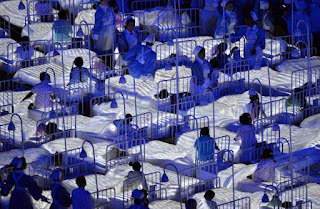 But children are incredibly adaptable in dealing with pain and injury. Usually an NSAID or acetaminophen is all that is required to alleviate pain in kids. If a narcotic is required, something less potent like Tylenol #3 is more than adequate for almost all maladies. Now if the FDA approves OxyContin use for children, I'm afraid that we'll be raising a whole new generation of drug addicts before they even have a chance to grow up and make mature decisions for themselves about what they want to put into their bodies. Or worse we'll have an army of kid drug dealers going through our schools distributing their doctors' prescriptions to any willing buddy with cash. You think pain doctors have a difficult time catching drug addicts hoarding prescriptions for narcotics? Wait til they have to say no to a parent who demands more OxyContin for their poor suffering Johnny because he has uncontrollable pain. The only one who wins in this pursuit is the drug company itself. This is pretty awesome news. 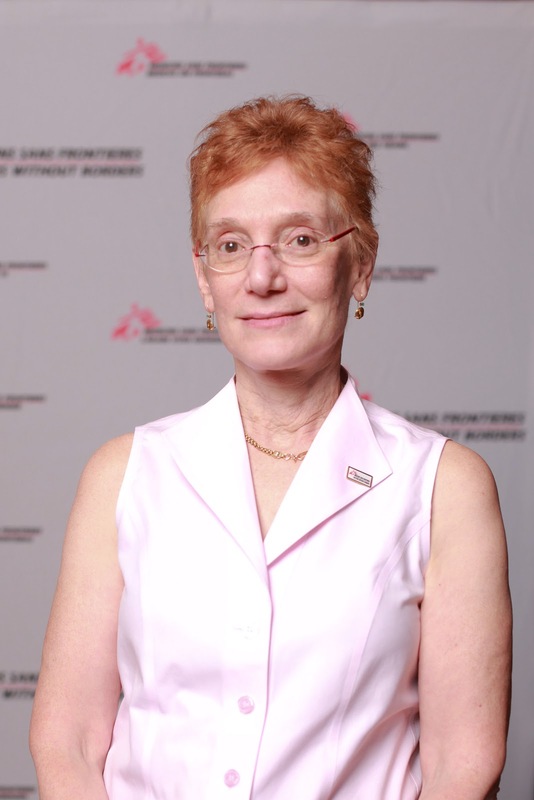 Dr. Deane Marchbein, an anesthesiologist affiliated with Massachusetts General Hospital, has been named president of Doctors Without Borders. She first joined the Nobel Peace Prize winning group in 2006. She served in the Ivory Coast at that time behind enemy lines and helped establish a rudimentary burn unit at the hospital. She recently worked in Lebanon and helped smuggle medical supplies into Syria to aid the massacres that are happening there. If you think everybody respects this humanitarian organization, you'd be wrong. Two people from the group were killed in Kenya six months ago while two others were kidnapped in Somalia this year. So working for Doctors Without Borders is not for the faint of heart. However, if you're interested, they are always looking for volunteers who are willing to make a time commitment of six to twelve months to join the group and alleviate the suffering of millions around the world. Dr. Marchbein herself takes an unpaid leave of absence from her job to work there. I salute the generosity of people like her. Work-Life Imbalance. I Just Had My First Vacation In Four Years. 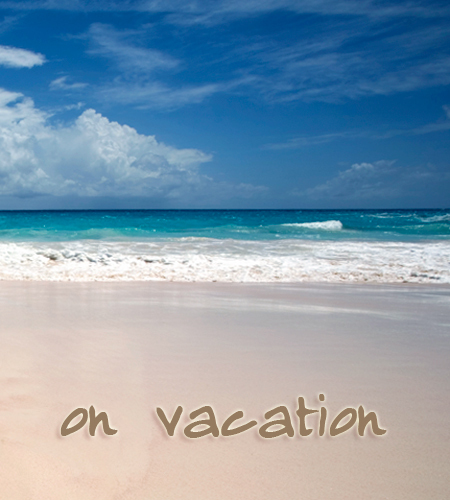 It's hard to believe but I've just had my first extended vacation in four years. By extended I don't mean I took 80 days off to cruise around the world on the QE2. My grand vacation lasted all of ten days. But that is quite an extended leave of absence by my standards. Prior to this, I had to satisfy myself with simple holiday journeys, the longest one being a road trip to Texas over Thanksgiving a couple of years back. How can this be, you might ask. 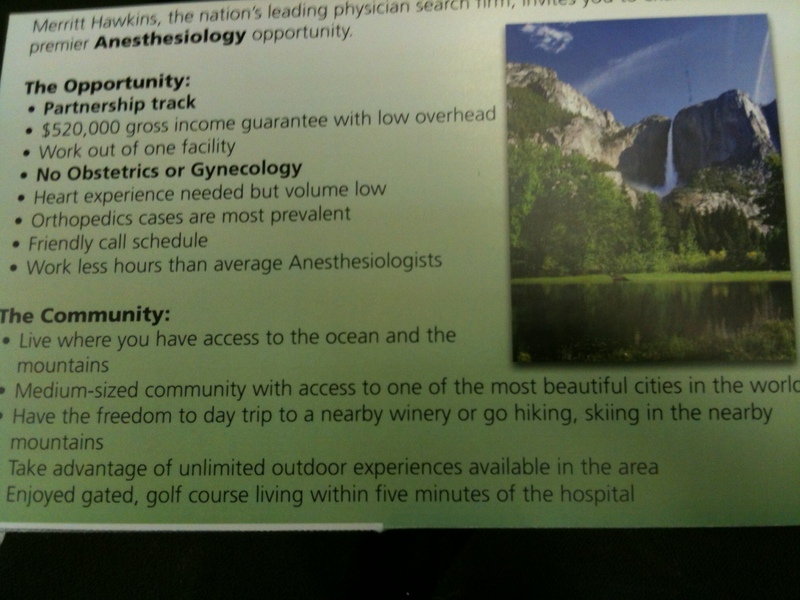 Don't anesthesiologists enjoy the most luxuriant lifestyles and carefree schedules of any medical profession? The short answer would be no. 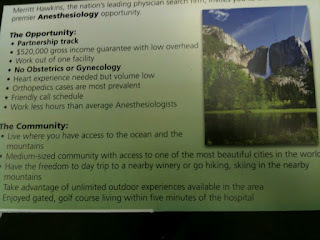 You see, many anesthesiologists, like myself, are really small business owners. We run a shop where customers pay for our goods and services. We have a billing department that keeps track of my accounts receivable, equipment to maintain, and other mundane business practices, just like a shopkeeper. Therefore, like a sole proprietor of a small store, when I go on vacation, I turn off the lights, lock the doors, and my income suddenly drops to zero when I am no longer offering my services while I'm out. However, unlike a small business owner, my practice is unlikely to get bigger, hire more employees, and expand. When small businesses get bigger, the owner can usually hire a staff to take care of the shop while he goes on vacation, while the store is still raking in money. That doesn't happen in medicine. I can't suddenly hire a bunch of anesthesia extenders like AA's or CRNA's to do the cases while I vaca to Paris and cruise down the Seine. I still have to be present while the procedures are being performed. I suppose that I could someday open up an ambulatory surgery center or pain center then hire people to work there. But then I'd be busy as an administrator when I'd rather be a practitioner. I sometimes fantasize about being a doctor employee, you know the kind that clocks in from 7:00 to 3:00 and doesn't give a darn about expediting cases and operation room efficiency. I could work at an academic institution or a large hospital group where I'd be nothing more than a cog in a giant medical industrial wheel. Then I'd be guaranteed paid vacations and benefits. Sure the pay is less and you have to work with a bunch of doctors who are just showing up for their retirement pensions. Think VA hospitals. But perhaps when I am older and the kids have moved out, that wouldn't be such a bad option. Oh, who am I kidding. I love my current job. Sure the last few years have been a little rough fiscally speaking. After all, we bought a new house a couple of years ago then spent months undergoing an extensive remodeling. I didn't have the time or the money to go on a long break. But this year, finally, I could exhale with relief as my finances edged back from the fiscal cliff. (For those who have remodeled your house, you know what I"m talking about) Thanks to my ginormous anesthesia income, this was made possible faster than any 99%er could fathom. From now on I vow to improve my work-life balance. I will take care of myself and my family better in the coming years by not working for 48 months straight. Life is too short to worry about where the next intubation will come from. The children are growing up too fast. The months just seem to fly by and here we are another half a year is behind us. 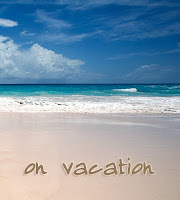 I'm already looking forward to my vacation next summer.